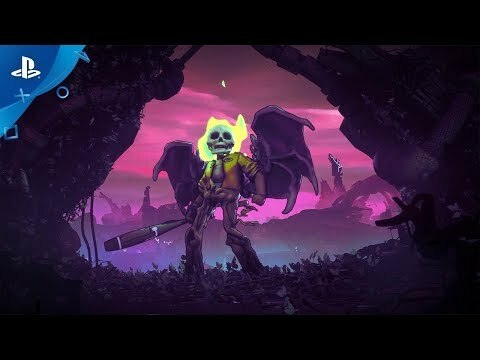 Explore a unique post-apocalyptic setting in a rogue-like adventure from veteran developer Double Fine Productions. Fight for the future of mankind in a 3D action rogue-like set in a post-apocalyptic world where humanity has faced armageddon not once, but twice. Venture into an ever-changing, radioactive wasteland known as the Fallow; a twisted environment filled with unspeakable creatures. It is here that you will find the means to heal the world and transform the cracked, barren landscape into a lush new source of life. However, your quest will come at great personal cost: the deeper you journey into these unknown lands, the greater your exposure to gnarly toxins that will wreak havoc on your fragile human form. Nevertheless, the fate of the world rests on you, your trusty bat and whatever strange new abilities your ravaged body might gain as it twists and mutates into something less human, but more powerful.